Our Whatsapp service 92487399 is limited to CNY BOOKINGS for customers; we regret that due to high volume of messages, we will not be able to attend to other enquiries. IMPORTANT: All appointments are only confirmed upon payment of deposit. Please note that we have different service menus for different dates! **Please note that only simple nail art will be available for non-gel services. **Please note that nail art will be available for gel services only. The best way to book a CNY appointment is to through Whatsapp (92487399) as deposits are required to confirm your CNY appointment. 1. Please check that you have typed in the correct contact number. We will make reminder calls 2-3 days before your scheduled appointment, and should we be unable to get through to you to confirm your appointment, your slot will be released to customers on our waiting list. 2. We require a deposit of $50/hr that we block for your appointment. This will also be the minimum spend required for your booking – so if you end up doing simple nail art when you have booked complicated art, there will be no refund of any unused credit as the time slot would have already been set aside for complicated art. If you are unable to come during the allotted time slot, please arrange for someone else to use it for you. The deposit is non-refundable for no-show and no changes in date/time are possible after the deposit is made. 3. Please be punctual. This is every salon’s busiest period of the year, with appointments packed back to back. Any lateness will affect not just other customers, but also your nail artist, who may not have a proper break or a chance to eat if her schedule is messed up. If you are late for 15 minutes or more, we reserve the right to cancel your reservation, assign a different nail artist, or ask that you downgrade your services (eg to switch to simpler art). 4. 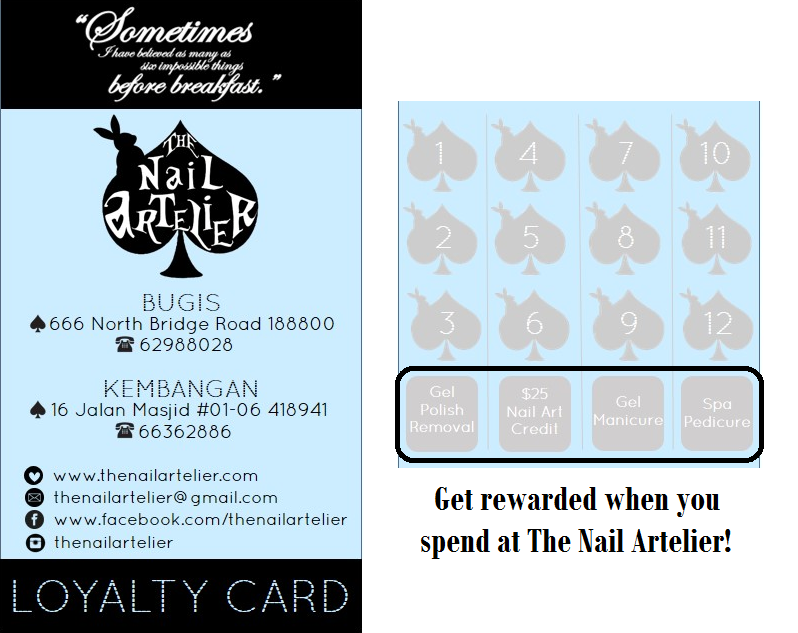 Packages and rewards (eg free gel manicure reward from accumulating 9 stamps on your loyalty card) cannot be used during this period. However, you will still receive one stamp for every $80 spent. 5. Please let us know in advance if you require complicated nail art. 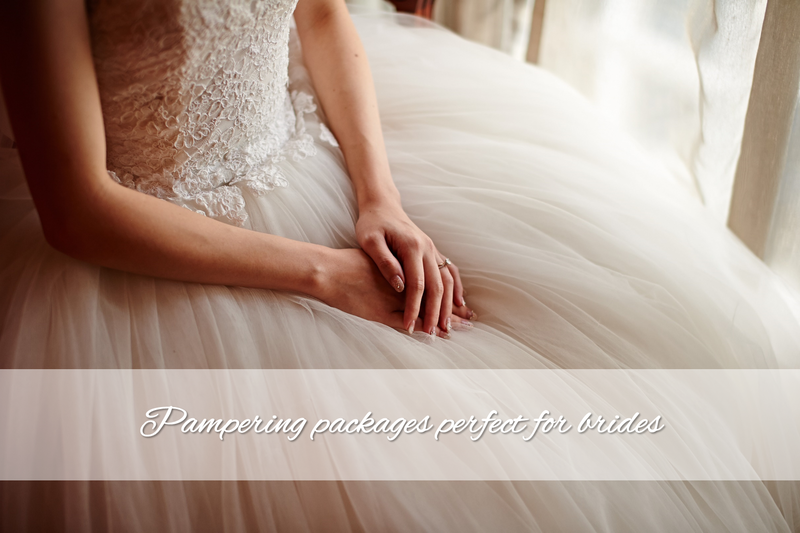 Otherwise, any manicure or pedicure with nail art is automatically given a time slot of two hours. Requests to switch to complicated nail art would affect other appointments, and would therefore not be possible. 6. 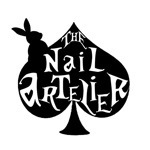 If you’re not sure if you should be booking for a normal slot or for complicated nail art, you can send us a link to the design you want when booking. As slots are limited for complicated art, we suggest booking a normal art slot and choose accent designs for your thumbs, and keeping the rest of your nails simple.